Geat elegant sport for your kids! 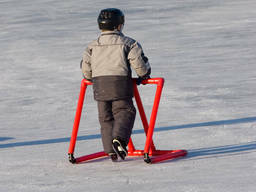 Ice skating involves gliding across an ice rink on boots with special blades and is a popular recreational pastime and even an Olympic sport. A great way for your kid to cool down on hot summer days! A talented young girl ice skating. <br>Your kids will love learning those moves and have fun on the rinks. Is Ice Skating a great activity for your kid(s)? Do your kids have energy to burn? Don’t want to exercise in the heat? Ice skating might be the sport for them! Your kids can get plenty of exercise, develop lower body and core strength and keep cool at the same time. Is your child afraid of getting a few bumps and bruises? Although ice skating is generally considered safe, the odd fall is inevitable so if your child is the nervous type they may be better suited to kids’ activities that are a bit more stable. Get your kid to start learning Ice Skating! Not sure what age to start? Kids as young as three can have a go at ice skating on an indoor rink although they probably won’t have the co-ordination to perform any sophisticated moves until they are at least four or five. It is a good idea to stay within arm’s reach of very young children, or hold their hand until they are confident skaters. Is your child interested in learning more? Group beginners ice skating lessons are available at most ice rinks and will generally cost around $15 - $30 per lesson which includes skate hire. Individual tuition costs more but is good for kids who are a bit older or more experienced and want to take their skill development seriously. Are you worried about your child getting injured? Concerned parents can buy protective gear including helmets and knee pads to help safeguard against injuries. Don’t forget to outfit your child to stay warm but keep clothing layered and lightweight so it doesn’t impede your child’s movement. If your child is not the figure skating type, there are plenty of other activities for kids at the ice skating rink. Ice hockey is a fast and highly competitive sport and speed skating is becoming increasingly popular. Many ice rinks hold social events such as ice discos and parties as a chance for kids to have fun and make new friends. Get your kids involved in this great sport for a chance to have fun and improve their fitness!